"Well that's the last time I use that dating app Plenty More Fish." I see Dave's been trawling the internet again on plenty of fish. We're gonna need a bigger condom. A fish called John Doe. When at sea for some time, Jimmy often sleeps with the big smelly ones, reminds him of his wife. "Captain! What shall we do with the little fella that come up in the net?" They are offishally a couple. Greetings God and all around from my new home. 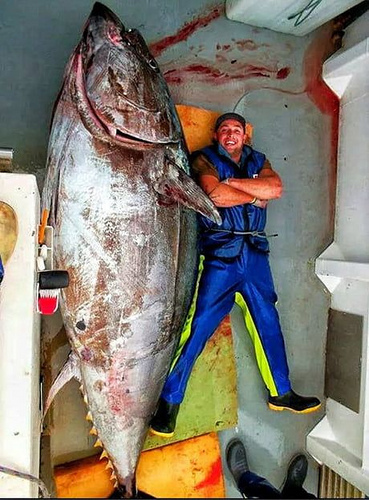 The biggest yellow fin tuna ever caught by a midget was 6 foot 2 inches long. I get it now. The fish is on the floor not on the wall. Well, I fell for that hook, line and sinker. "I've always wanted to make love to Gail Tilsley"
He thinks he's a real catch. Now all you need to do is hit an iceberg, then you can have lettuce with it. "And that, kids, is how I met your mother." There was much canned laughter. While his mates were working, Pete had fallen asleep in the hold. He was gutted. "You're gonna need a bigger man"